PAG, the British designer and manufacturer of the PAGlink system of lightweight, intelligent linking batteries, will introduce an upgraded version of its ultra-compact travel charger at IBC 2017, stand 12:B36 (Aspectra). The new PAGlink V-Mount Micro Charger features a tougher, injection-moulded housing, and is designed to accept DC as well as AC input. These added benefits make it an even more versatile location charger for camera professionals who wish to travel light. 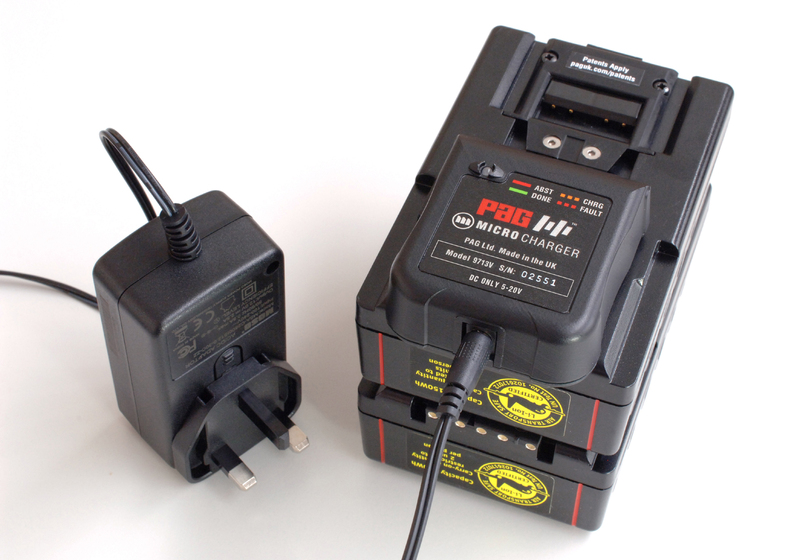 The principle of the new Micro Charger remains the same as the original version: the charging unit, which is small enough to fit in your pocket (73 x 62 x 31mm), clips onto the V-Mount contacts of a single PAGlink battery, which can be linked to additional PAGlink batteries of any rated capacity, in any state of charge. The Micro Charger is intended for charging up to 4 linked batteries. The charging unit is then connected to its power supply unit that enables charging from AC supplies worldwide (100-240V). Interchangeable power plugs allow direct connection to the AC supply without the need for adaptors. The new charger can also be powered from 5V-20V DC supplies. DC power cables are included that allow charging from a 12V vehicle battery, via the dashboard cigarette lighter socket, or a USB charger (2A). The charging times will be similar when powered from either an AC mains supply or a 12V vehicle battery. The ability to charge multiple batteries using one charging channel was developed by PAG and is unique to the PAGlink system. The Micro Charger will address the most-discharged batteries first, until all the batteries are in a similar state of charge, it then fully-charges them simultaneously, without intervention. 3 fully-discharged 96Wh batteries will be fully-charged in 12 hours. Charging time will be substantially less when the batteries are only partially discharged at the beginning, and when they are removed after reaching 90% capacity. The last 10% takes relatively longer, because the charge rate is reduced. PAGlink intelligent Li-Ion batteries control their own charging and lower the current automatically, at the end of the process, which contributes to a longer battery life. The Micro Charger features LED indication of charging, charge completion, an absent battery, and a faulty battery. PAG batteries offer accurate, high-resolution state of charge information, on their own display. This allows you to monitor closely their capacity, during charging. The PAGlink V-Mount Micro Charger can also be used for charging sequentially individual non-linking Li-Ion batteries manufactured by PAG and Sony. The ultra-compact lightweight charger, its PSU and DC cables, will fit easily in any camera bag. PAG claims it is the broadcast industry’s smallest, most economic, multi-battery charger. A Gold Mount version is also available.